Late last month, Google previewed a new launcher for Chrome OS, but as of the new Chrome OS 42 release, the new launcher is now available to the masses. Launcher 2.0 in Chrome OS 42 has a new look that’s based on the Material Design look and feel featured in Android Lollipop. 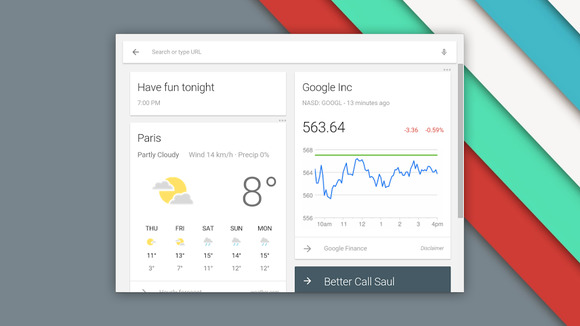 Google Now integration means you can quickly get information—such as weather conditions, stock quotes, and your calendar events—at a glance, and perform Google searches with your voice. Other new features in this release include a new version of the Calculator app, new support for password-protected ZIP files, and a reworked Files app that better fits the Material Design motif. Google also switched the system font to Roboto—the same used for Android—to make the whole system more Material-y. Google says that Chrome OS systems will receive automatic updates to Chrome 42 “over the next few weeks,” so if you haven’t gotten the update yet, you should get it in the not-too-distant future. Why this matters: In the grand scheme of things, Chrome OS 42 seems like a fairly small update. Yes, the new Launcher and freshened-up look and feel look to be welcome changes, but it’s nothing groundbreaking. It is a sign, however, that Google is looking to unify the user experience some between Android devices and Chromebooks. Add in the in-the-works Android Runtime for Chrome—which allows you to run Android apps on your Chromebook—and all sorts of interesting future possibilities open up.